The war on terrorism and the threat of chemical and biological weapons have brought a new urgency to already complex moral and bioethical questions. 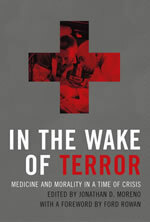 In the Wake of Terror presents thought-provoking essays on many of the troubling issues facing American society, written by experts from the fields of medicine, health care policy, law, political science, history, philosophy, and theology. One of the first potential casualties of catastrophic circumstances is civil liberties. In the past, medical experiments conducted for national security purposes have violated ethical standards, and this book questions whether current policy provides sufficient safeguards against further abuses. It also focuses on public health issues, offering contrasting views on the extent to which civil authorities should be allowed to restrict freedom of movement in the name of national security and debating whether aggressive public health interventions improve public confidence and cooperation or detract from them. A major area of concern is preparedness for future terrorist attacks. Chapters are devoted to ethical issues involved in the development, distribution, and rationing of vaccines and antidotes; resource allocation and medical triage; the moral duties of emergency health workers and other first responders; and the obligations of private entities such as managed care organizations and pharmaceutical companies. Contributors also address the implications of terrorism for our health insurance system and the role of genetic advances in bioterrorism. Underlying all of these issues, the authors argue, is the need to maintain a spirit of social solidarity, which can in turn only be achieved if preparations are publicly acknowledged and generally regarded as both prudent and fair.